God, we are desperate for You. 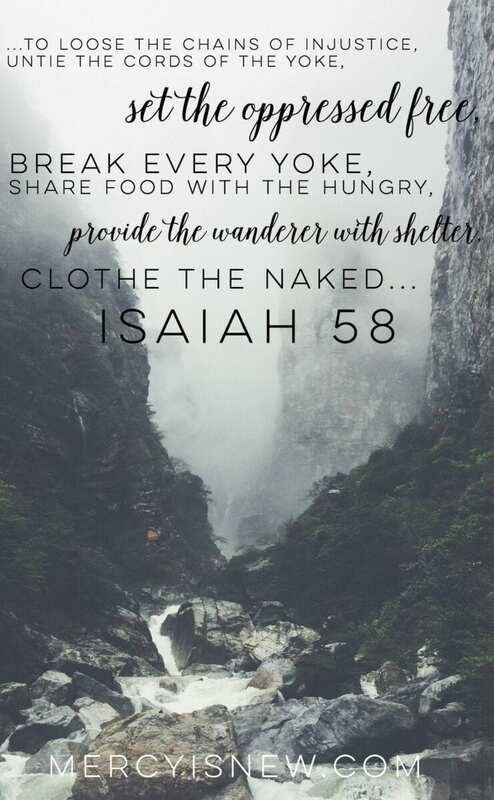 You sent Jesus to be all these things to us: to loose the chains of injustice, to untie the cords of the yoke, to free the oppressed, to break every yoke, to share food with the hungry, to provide shelter for the poor, to clothe the naked. God, may we go and do the same. May we be Jesus to these You love. When we do those things listed in Isaiah 58, it won’t be easy. “Genuine spirituality is not cozy and seldom makes you comfortable. It challenges, disturbs, unsettles, and leaves you feeling like someone is at the center of your existence on a major remodeling mission.” Radical Hospitality, p. 73. Getting out of our comfort zones is never easy. But it’s always good for us, yes?